The weekend of the Pet Expo is always crazy. We have to ask our kennel partners to open early and stay late to accomodate the very long hours 3 days in a row. We do switch the dogs out and give them breaks from the booths, but it is still a very busy weekend. 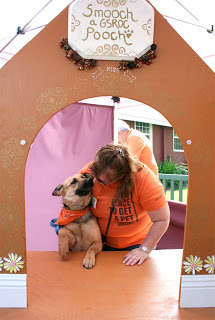 Here is one of our volunteers stealing a free kiss from Kenai BEHIND the kissing booth. One of the perks of volunteering with GSROC!